Nebraska’s struggles continued on Saturday as the Huskers dropped their fifth straight game, falling at Illinois 71-64. The Huskers (13-9, 3-8 Big Ten) failed to crack 40 percent from the field for the fourth time in their last five games, finishing at 38.5 percent, and they shot 3-of-23 from deep. James Palmer Jr. finished with 22 points on 6-of-20 from the field, 2-of-7 from 3 and 8-of-12 from the line with eight rebounds. He had eight points on 2-of-10 shooting in the second half. Glynn Watson Jr. finished with six points on 3-of-12 shooting (0-of-6 from 3) and no assists in 30 minutes before fouling out and was a team-worst minus-15. Isaiah Roby had nine points on 3-of-11 shooting (1-of-5 from 3) and 2-of-4 from the line with eight rebounds. Thomas Allen Jr. had a rough first half (2 points on 1-of-4 shooting) but finished with 11 points on 5-of-12 shooting (0-of-4 from 3), three assists and four turnovers. Perhaps the lone bright spots form the game was the play of senior Tanner Borchardt who recorded his first career double-double with 12 points and 18 rebounds (11 offensive) — all career highs. Nebraska grabbed 21 offensive rebounds but only converted them into 18 second-chance points. Illinois only grabbed eight offensive boards but turned them into 16 points. Nebraska outscored Illinois 40 to 32 in the paint but Illinois shot 8-of-20 from 3. Kipper Nichols, who had not scored in his last five games, hit his first four shots and led the Illini (7-15, 3-8) with 18 points on 7-of-8 shooting. Illinois jumped out to a 7-0 lead, hitting its first three shots and forcing two misses and a turnover from the Huskers. After a quick timeout by Tim Miles, Nebraska regrouped and put together a 10-0 run including eight points from Palmer. 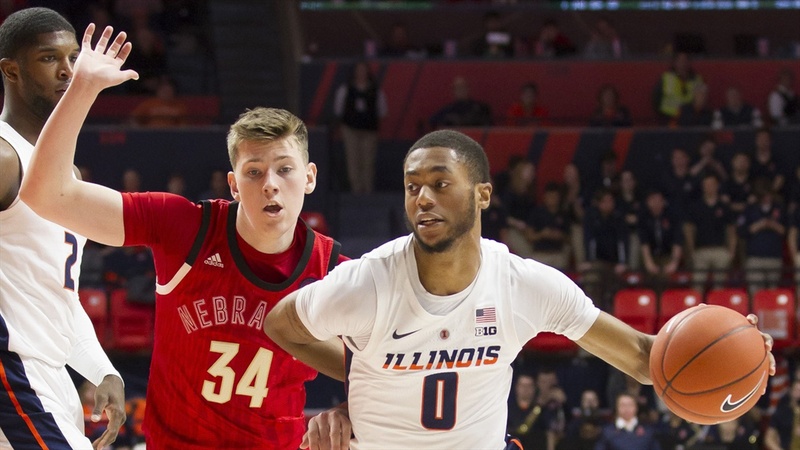 Illinois tied it up at 13-all but Nebraska pulled ahead again with a 3 by Isaiah Roby and a dunk by Amir Harris, but the offense dried up once again for Nebraska. Illinois ripped off a 10-0 run to pull ahead 23-18. Palmer drew Illinois’ seventh foul of the half at the 8:26 mark to put Nebraska in the bonus and he split the free throws to end Nebraska’s scoring drought. However, Illinois continued to pile it on, stretching the lead to double figures for the first time with a pull-up 3 in transition by Trent Frazier that made it 36-25. The teams traded scores down the stretch and Illinois took a 38-29 lead into halftime. Nebraska shot 32.3 percent from the field including 3-of-12 from 3 and 6-of-13 from the free-throw line. Palmer had 14 points in the first half but he shot 4-of-10 from the field and 4-of-8 from the foul line. Watson missed all five of his shots and was held without a point or assist in the first half. The second half started much like the first with Nebraska struggling mightily to score. It took the Huskers three minutes to get on the board with Palmer hitting a pair of free throws at the 6:56 mark. The Huskers turned the ball over on three consecutive possessions before that free throw and fell behind by 15. Nebraska got going a bit on offense, cutting it to 11, but they couldn’t get a stop and ended up trading buckets over the next couple of minutes before the Huskers managed to string a few scores together with a put-back by Thorir Thorbjarnarson, a bucket by Allen and a put-back by Borchardt. Illinois answered with a free throw and a layup to push the lead back to 11 at 54-43. Watson scored his first points of the game on a layup at the 11:01 mark then knocked down a short jumper after an offensive rebound by Borchardt to cut it to seven. Then the shots stopped falling once again. Nebraska went nearly five minutes without scoring, allowing the Illini to build their lead back up to 13 at 60-47. Nebraska scored on its next three possessions, but Illinois scored on three of four to maintain the lead with just over three minutes to play. With Illinois leading by 14, Thorbjarnarson fed Borchardt for a layup, giving the senior his firs career double-double, then a stop led to a transition dunk plus the foul by Palmer to cut it to nine at the 1:46 mark. Andres Feliz missed two free throws and Borchardt scored again to cut it to seven with 1:26 to play but that was as close as the Huskers would get. Feliz hit his next two free throws to push it back to nine. After a couple of empty possession by each team, Allen split a pair of free throws then Nichols hit two to push the lead back to 10. Palmer converted a three-point play with 37 seconds to play and neither team managed to score the rest of the way. Nebraska shot 0-of-11 from 3 in the second half. Illinois shot 5-of-19 from the free-throw line in the second half and 9-of-23 overall but the Huskers couldn’t take advantage down the stretch. Next up for the Huskers is a rematch with No. 24 Maryland on Wednesday. The Terrapins beat the Huskers 74-72 in College Park on Jan. 2. Tipoff from Pinnacle Bank Arena is set for 6 p.m.